On this the anniversary of Gettysburg, I hope you’ll pardon a departure from our normal Fredericksburg-centric fare. I wish I could say that Gettysburg doesn’t interest me, largely because it interests just about everyone else (I confess it irks me no end that the most popular post in this blog’s existence remains a post about a bullet found in a tree at Gettysburg). Historical revelations about the battle dwell in the deep details that, in a historical sense, often really don’t much add to our understanding of why Gettysburg matters so much to Americans. If anyplace illustrates how Americans’ traditional quest for knowledge about the Civil War trumps our desire to understand, Gettysburg is it. We know the details cold and increasingly; we understand why they matter only vaguely. 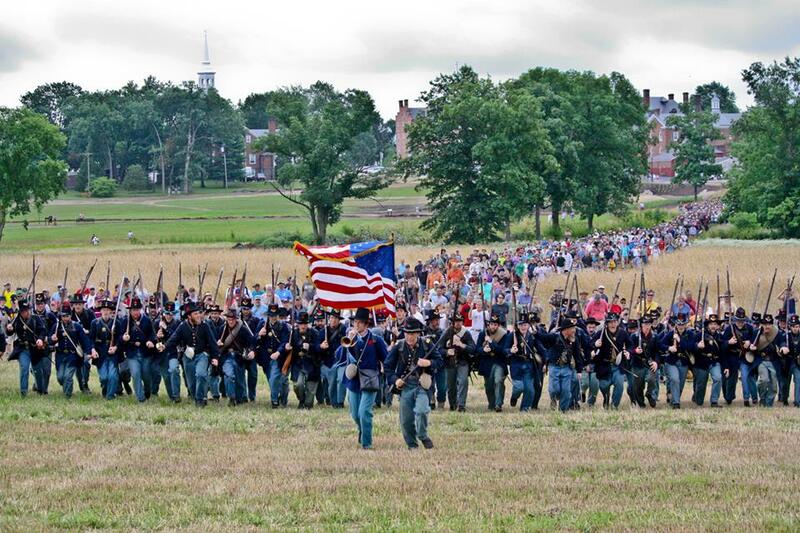 July 1, 2013–the march to McPherson’s Ridge attended by hundreds. NPS photo. Yet, the place, the event, and the culture that surrounds Gettysburg fascinates me. I probably know (or at least knew) as much about Gettysburg as I do about anyplace other than Manassas (including our own four battlefields in Fredericksburg’s environs), but in many ways it’s knowledge put to no good use–it’s amusement or self-reflection largely. So it is for most of us. That in itself is not a bad thing. For me, the story of Gettysburg, told by MacKinlay Kantor and American Heritage in all its human detail, spurred an interest in history that shaped my life. Gettysburg is America’s simplistic case-study in civil war: the place where all that Americans feared or hoped for was realized or dashed amid a tumult of human struggle. On no event in our history have we imposed more than on Gettysburg. It is the Confederacy’s “high tide.” It alone is America’s “new” birthplace of freedom. On the ground, no event seems more pregnant with possibilities than Gettysburg. Faulkner’s “every Southern boy” lives perpetually on the cusp of Pickett’s charge. Generations have reveled in the rumination, “if only Jackson had been at Cemetery Hill as the sun set on July 1….” William C. Oates and Joshua Chamberlain battled for nothing less than the fate of the Republic on the slopes of Little Round Top on July 2. Americans thrive in the world of the possible but unprovable–the world just beyond truth, just beyond our reach. We cannot resist filling that intellectual and emotional space with high drama. Might-have-beens enthrall us, spur us to imagine. No single place in America has been the subject of such vivid imaginings as Gettysburg. That we imagine so fervently at Gettysburg suggests to me that we pay far too little attention to the rest of the war, for the rest of the war gives us plenty with which to quell fantastic speculation. What if Jackson had been at Gettysburg? 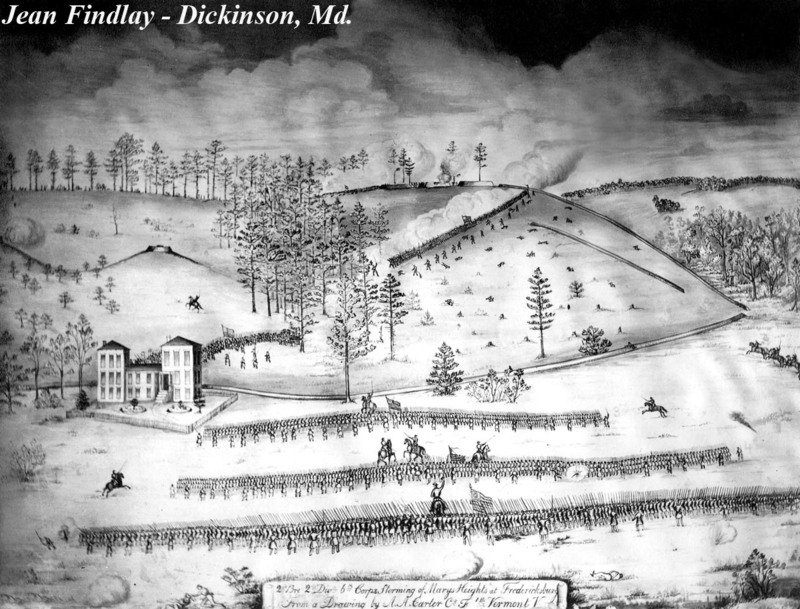 Jackson was at Chancellorsville and engineered a stunningly successful demolition of the Union flank–an attack that achieved all that might have been hoped. The result: a won battle, unchanged war. What if William C. Oates had vanquished Joshua Chamberlain and took Little Round Top? The Confederate army had been there before too: Longstreet overwhelmed the Union flank at Second Manassas on a far greater scale. The result: a decisive victory, but war unrelenting. What if Lee had won at Gettysburg? Would the Union army have collapsed like a broken camp stool? Lee had won in front of Richmond, at Manassas, at Fredericksburg and Chancellorsville. None of those Union armies had collapsed. It seems to me that the Union army’s presence on Northern soil makes it even less likely it might have done so in July 1863. Our mania about Gettysburg, and Gettysburg alone, compels us to see it as a petri-dish of immense and immediate possibilities rather than as part of a grinding, consumptive war that by 1863 was little affected by the outcome of a single battle. Having said all that, there is no denying Gettysburg’s singular place in American culture and in the lives of most Americans who have an interest in the Civil War. Gettysburg is the biggest. We love big. Gettysburg is the place where Lincoln chose to connect the sacrifice and purpose of war. His was a speech about the war at large, and it could have been given appropriately at a dozen places. But he chose Gettysburg (not only was it the war’s deadliest battle, but also, in 1863, its most accessible battlefield), and so Gettysburg is seen by many through the lens of Lincoln’s address. 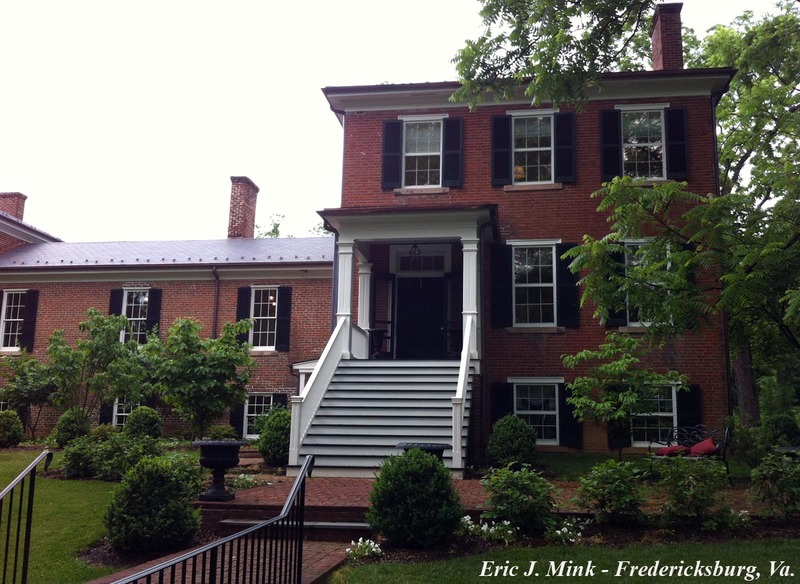 Other places, like Antietam and even Fredericksburg or Fort Monroe, may lay claim to a more immediate and intrinsic connection between freedom, Union, and war. But Lincoln chose Gettysburg, and so do we.